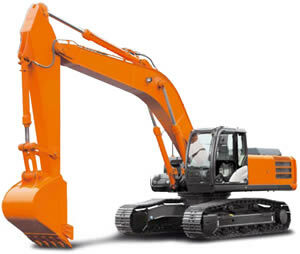 Modern, hydraulic excavators come in a wide variety of sizes. The smaller ones are called mini or compact excavators. For example, Caterpillar's smallest mini-excavator weighs 2,060 pounds (930 kg) and has 13 hp; their largest model is the largest excavator available (a record previously held by the Orenstein & Koppel RH400) the CAT 6090, it weighs in excess of 2,160,510 pounds (979,990 kg), has 4500 hp and has a bucket size of around 52.0 m³ depending on bucket fitted. Engines in hydraulic excavators usually just drive hydraulic pumps; there are usually 3 pumps: the two main pumps are for supplying oil at high pressure (up to 5000 psi) for the arms, swing motor, track motors, and accessories, and the third is a lower pressure (700 psi) pump for Pilot Control, this circuit used for the control of the spool valves, this allows for a reduced effort required when operating the controls. The two main sections of an excavator are the undercarriage and the house. 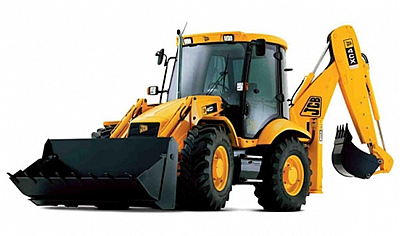 The undercarriage includes the blade (if fitted), tracks, track frame, and final drives, which have a hydraulic motor and gearing providing the drive to the individual tracks, and the house includes the operator cab, counterweight, engine, fuel and hydraulic oil tanks. The house attaches to the undercarriage by way of a centre pin. High pressure oil is supplied to the tracks' hydraulic motors through a hydraulic swivel at the axis of the pin, allowing the machine to slew 360° unhindered. Most are mono booms: these have no movement apart from straight up and down. Some others have a knuckle boom which can also move left and right in line with the machine. Another option is a hinge at the base of the boom allowing it to hydraulically pivot up to 180° independent to the house; however, this is generally available only to compact excavators. There are also triple-articulated booms (TAB). Attached to the end of the boom is the stick (or dipper arm). The stick provides the digging force needed to pull the bucket through the ground. The stick length is optional depending whether reach (longer stick) or break-out power (shorter stick) is required. On the end of the stick is usually a bucket. A wide, large capacity (mud) bucket with a straight cutting edge is used for clean-up and levelling or where the material to be dug is soft, and teeth are not required. A general purpose (GP) bucket is generally smaller, stronger, and has hardened side cutters and teeth used to break through hard ground and rocks. Buckets have numerous shapes and sizes for various applications. There are also many other attachments which are available to be attached to the excavator for boring, ripping, crushing, cutting, lifting, etc. 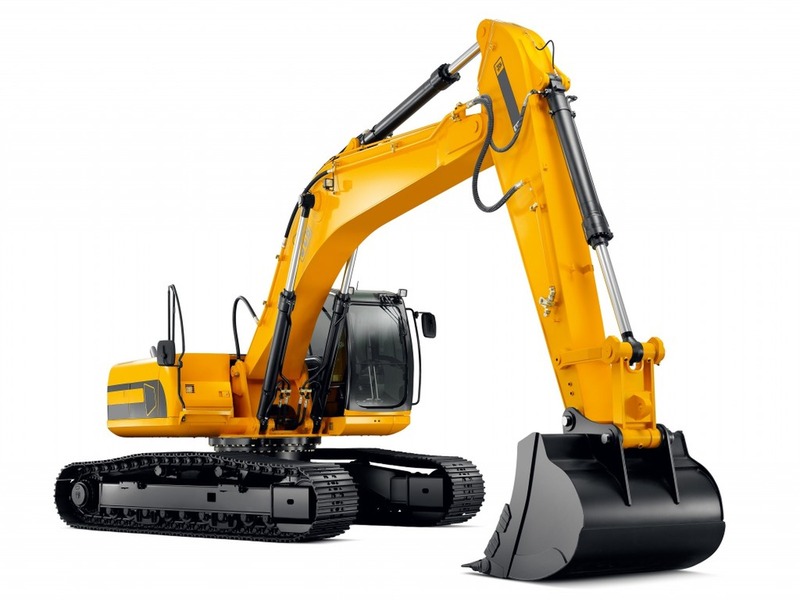 Before the 1990s, all excavators had a long or conventional counterweight that hung off the rear of the machine to provide more digging force and lifting capacity. This became a nuisance when working in confined areas. In 1993 Yammer launched the world's first Zero Tail Swing excavator, which allows the counterweight to stay inside the width of the tracks as it slews, thus being safer and more user friendly when used in a confined space. This type of machine is now widely used throughout the world.